Please visit this page for latest updates and information on all school activity. Scroll down the page to read more! 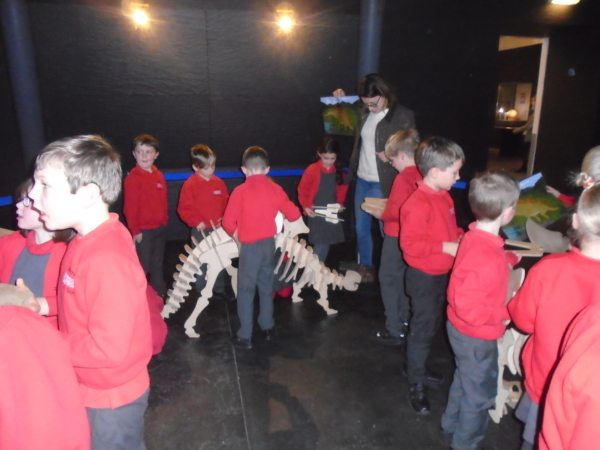 Our Owl Class went to the Natural History Museum today, which is a nice end to their dinosaur topic. 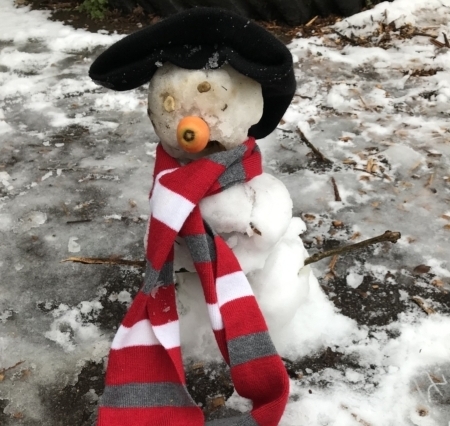 We had a little bit of snow today so the children made a snowman! 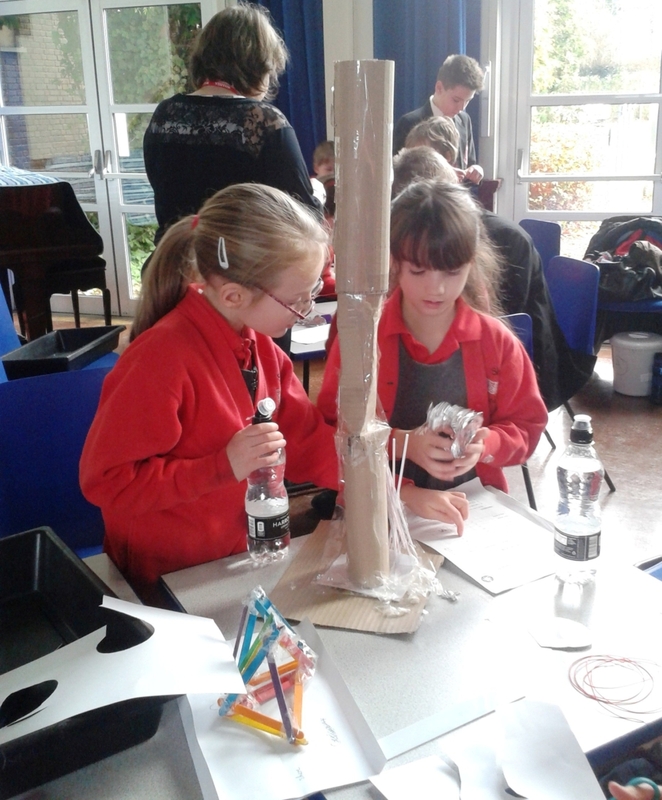 Our Owl class went to Glebelands School for a Science Challenge this morning. They took part in lots of DT experiments and used their maths skills too. 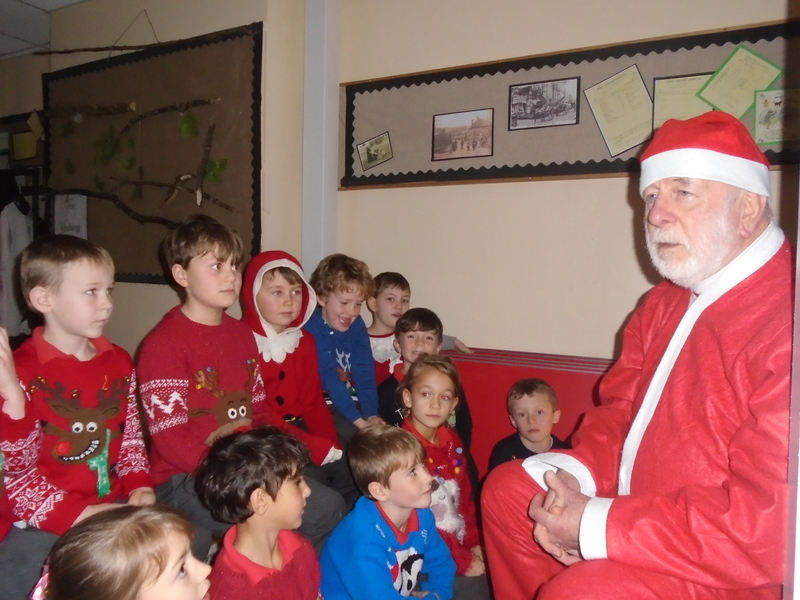 It is Christmas Jumper day today and we had a special visitor from Father Christmas…. 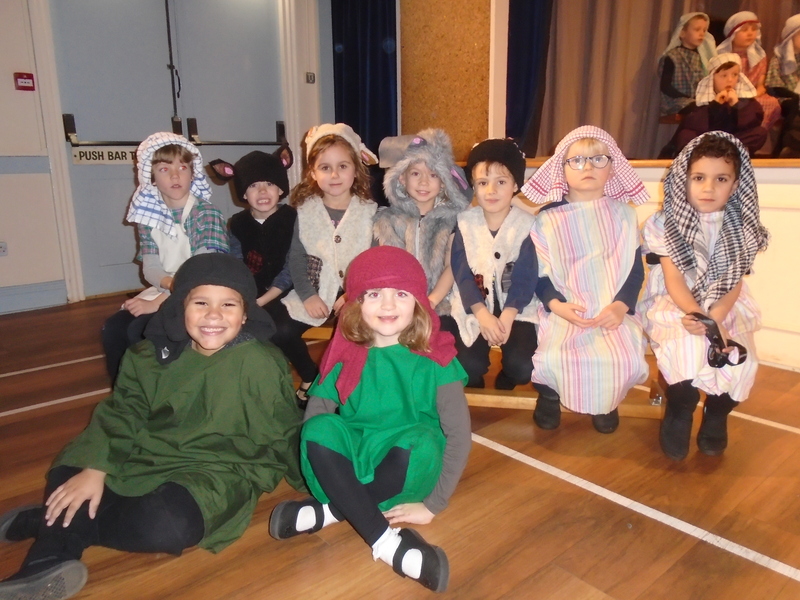 Here are some of our Hedgehogs getting ready for the Nativity Performance. 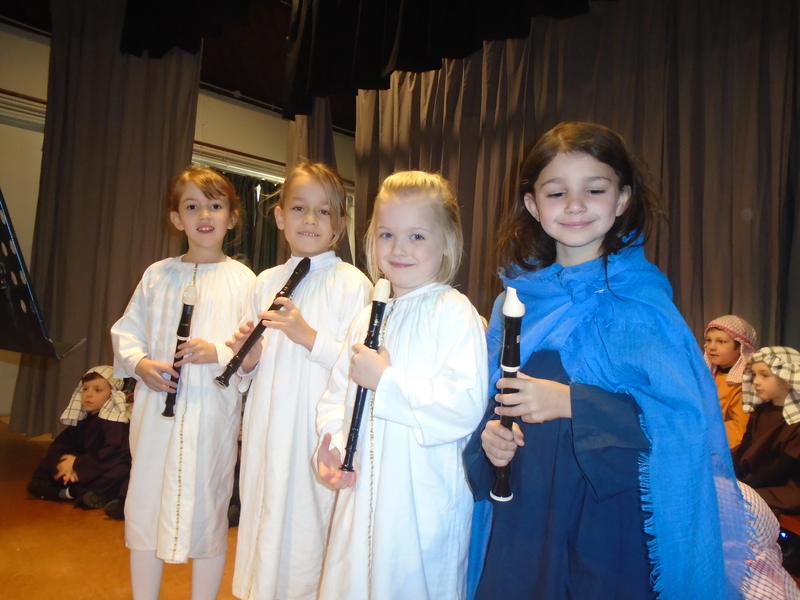 Our recorder club performed brilliantly at our Christmas Nativity Sing Song. 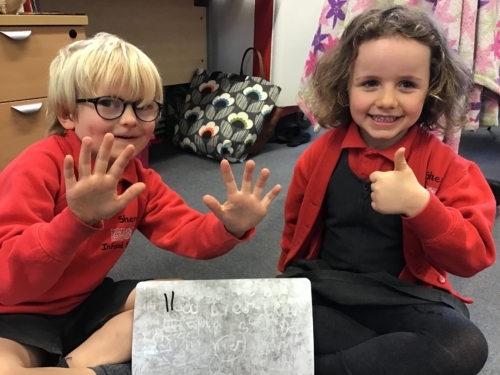 Year 1 have been busy learning teen numbers – they have worked out number 11 is 1 ten and 1 unit. 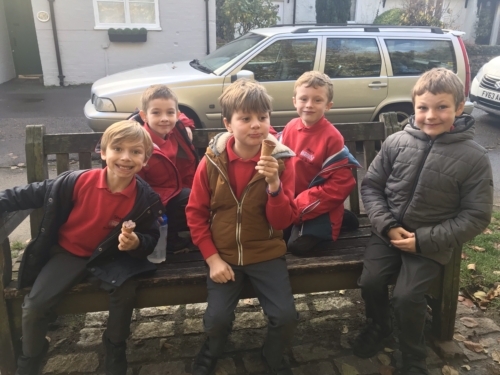 Due to a lot of rain and wet breaks Mrs Toone thought the children in Owl class had been in too much and needed some fresh air so they all went for a walk around the village… and ended up in Shere Delights for ice creams. Owls and Hedgehogs gathered at the war memorial in Shere on Friday for a Remembrance Service. The children were so well behaved and sang a beautiful song. Huge heartfelt thanks to Tushna, Sunny and Jenna for organising such a wonderful Diwali celebration. 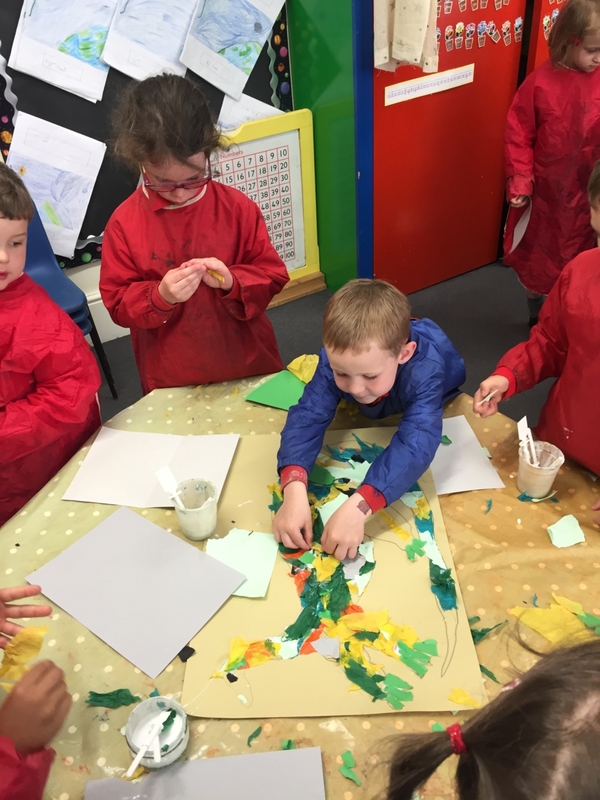 The children loved learning and celebrating together. See photo of the children learning a Diwali Dance. 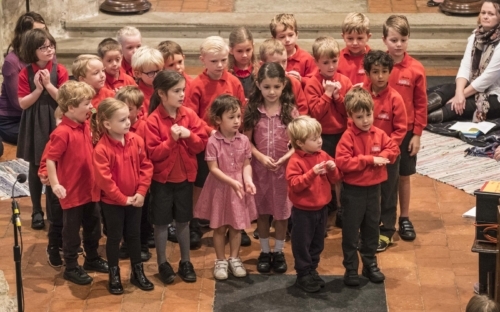 The children of Shere School & Fox Cubs Nursery did so well at the Harvest Festival Church Service on Sunday. 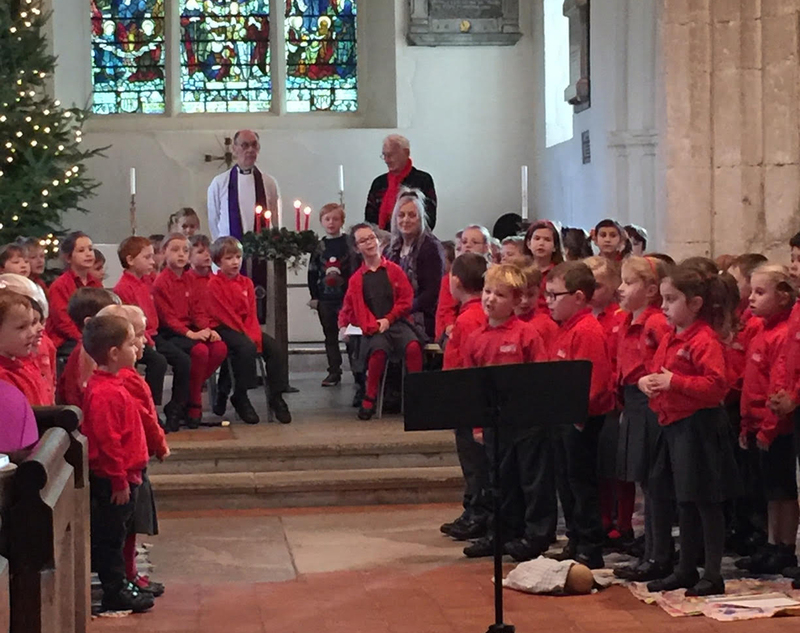 They sang their hearts out to ‘Big Red Combine Harvester’ and ‘Cauliflower’s Fluffy’ and bought lots of food for the Guildford Food Bank. 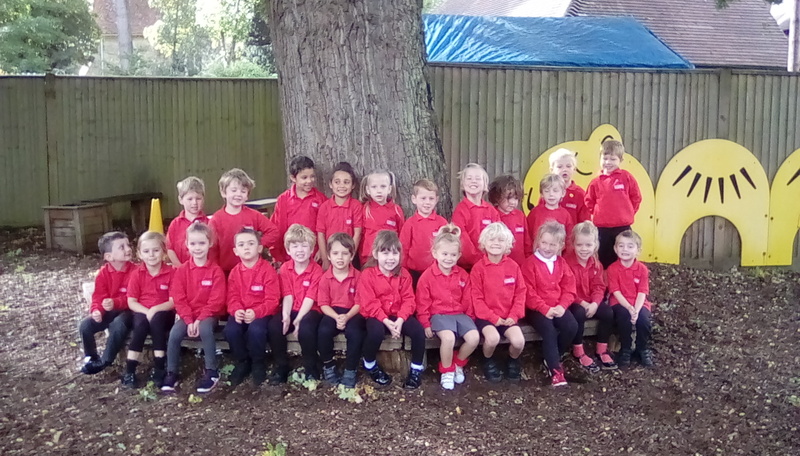 Our new reception class started on Monday 10th September, they are all settling in really well and have enjoyed their first week at school. The whole school went to Littlehampton today. 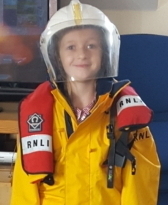 The children spent the day visiting the RNLI, the Look & Sea Centre and then spent the afternoon on the beach and the sun was shining all day. 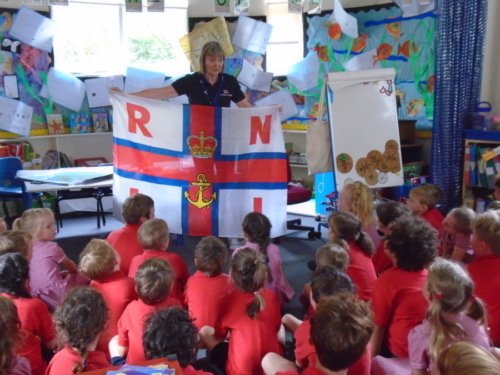 Mrs Joy Davis from the RNLI came to speak to the children about keeping safe around the water and the very important work of the RNLI. They went through warning flags on the beach and what to do if you are in danger in the water. 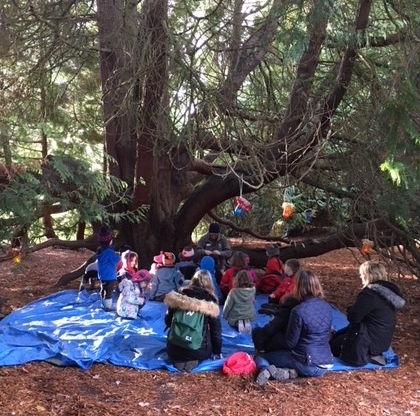 Year 2 went pond dipping yesterday in their forest session. They found a big American Cray Fish and lots of shrimps. 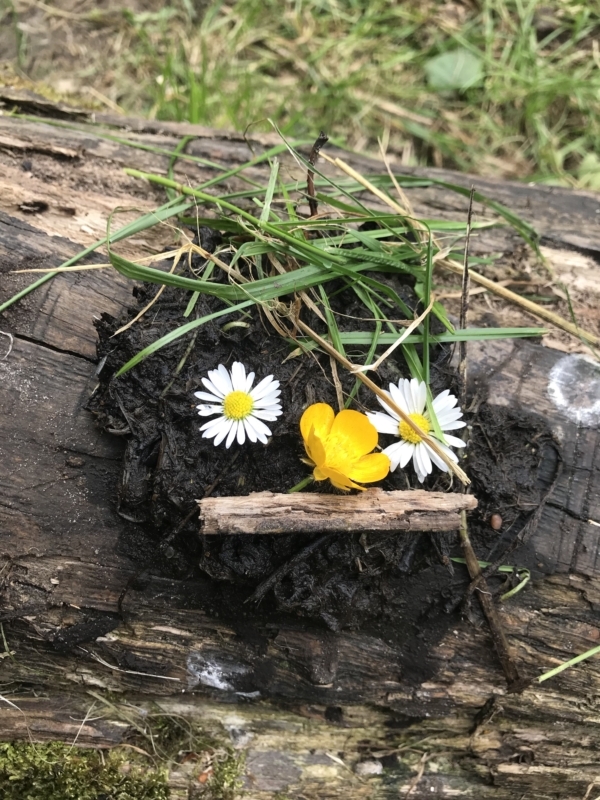 They also found time to make ‘Mud Faces’ this is Mrs Toone! 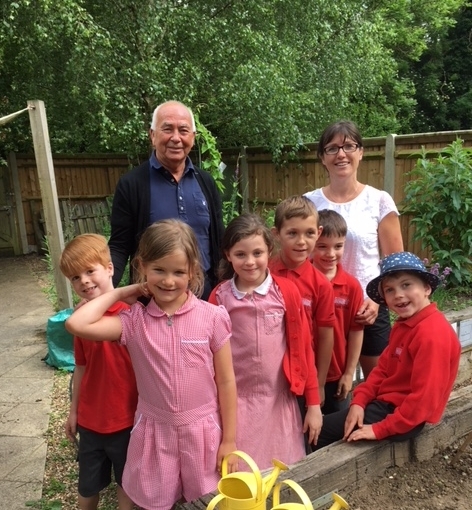 This is our Gardening Club, they have worked so hard this term growing peas, carrots, strawberries and herbs and have learnt so much about the garden, they even mowed the lawn! Many thanks to Mrs Standing our school cook and Mr Cook our caretaker. 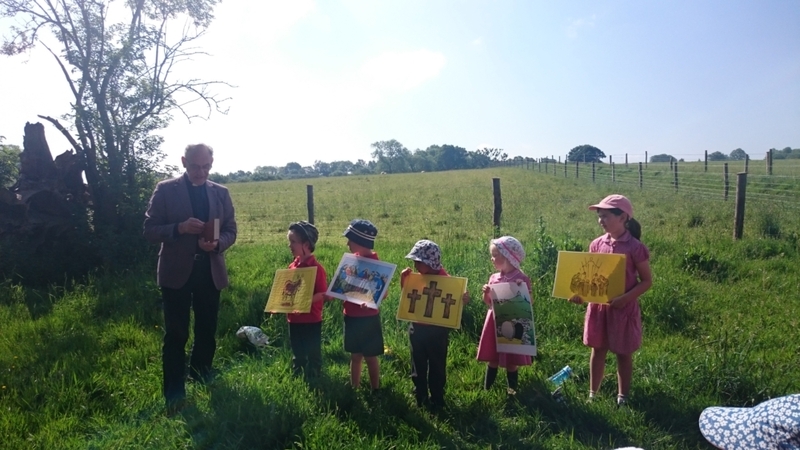 The whole school walked up the hill behind St James Church in Shere to learn about Ascension Day with Canon Nick. It was a beautiful day for it. 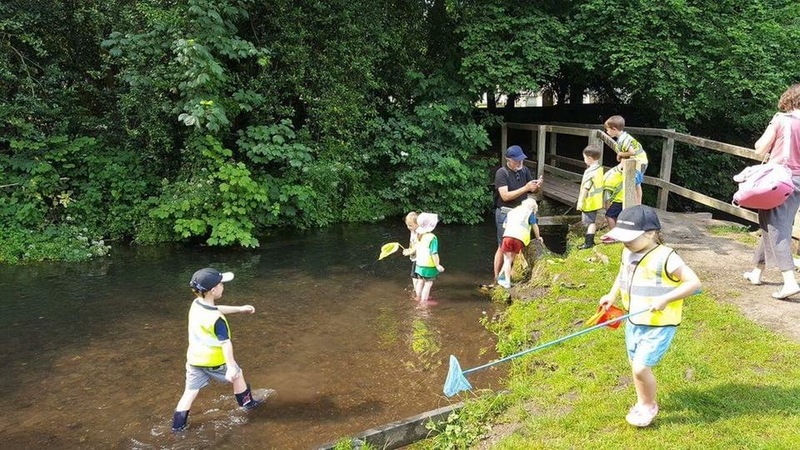 The children spent the day at the Tillingbourne River today. 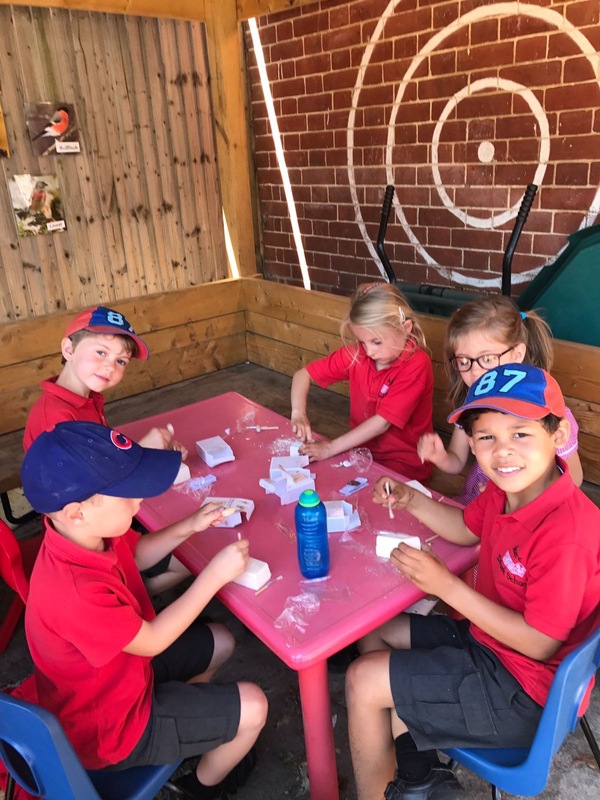 Experiencing hands-on learning. 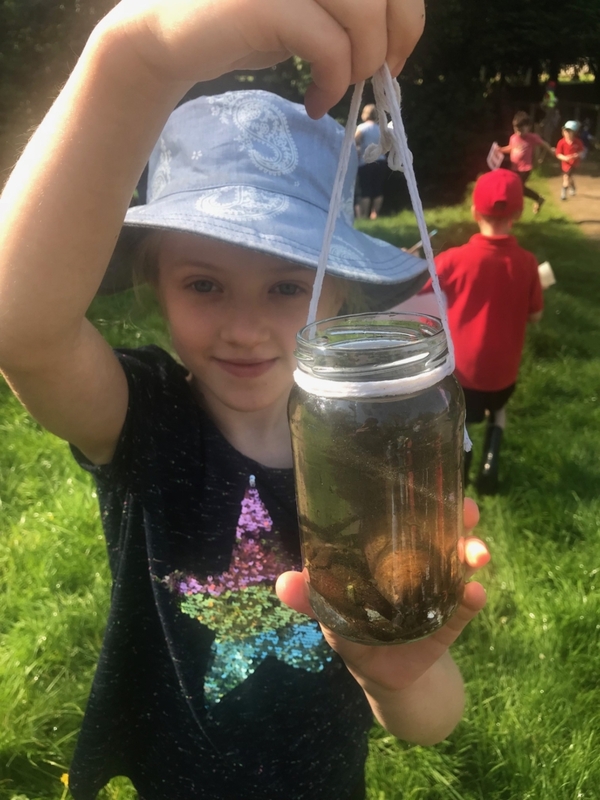 They did pond dipping, pooh sticks, wild flower hunting, painting and even caught a Crayfish! It was a great day for all involved. We celebrated Holi Festival which is the Hindu Celebration of Love, Frolic and Colours. The children had a wonderful time, as did the teachers!! 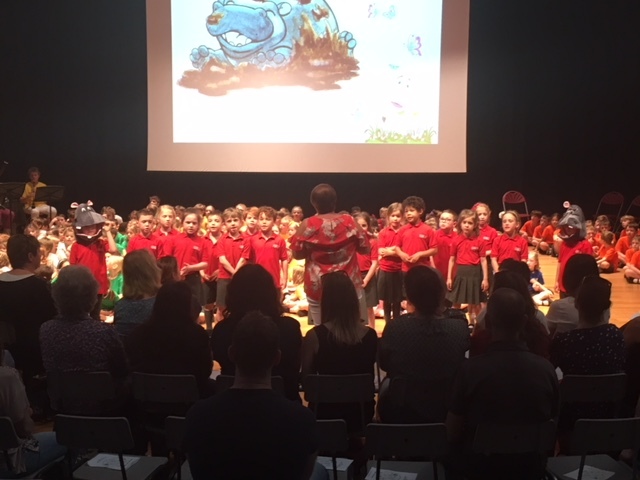 On Friday, Year 2 joined other local schools for our annual Spring Sing Concert. The children’s behaviour was exceptional throughout and their performance was superb. For the smallest cohort in the building, they raised the roof! It left the teachers bursting with pride. 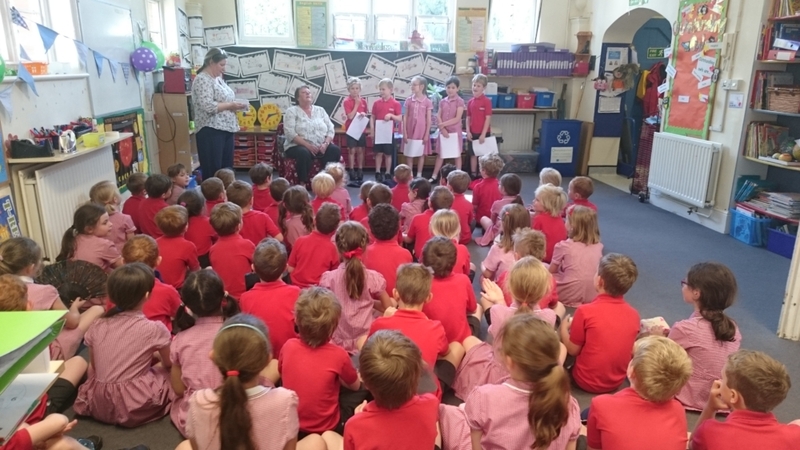 Well done Year 2 and Mrs Toone, and thank you to parents for transporting & supporting the children so enthusiastically. 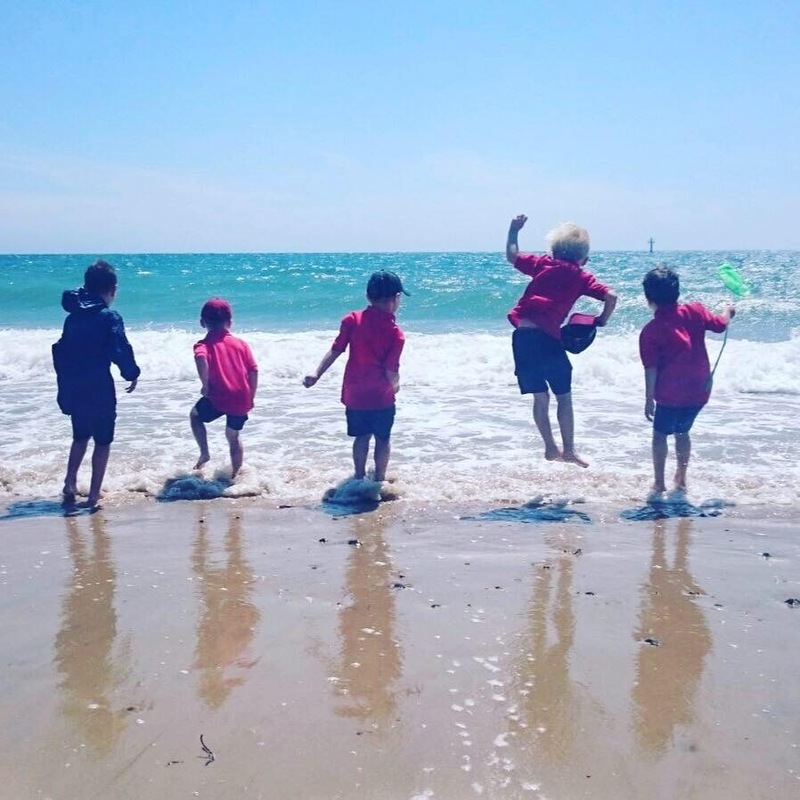 Our school trip to the aquarium was glorious, the weather just perfect for a day by the sea. It was great to see the children so engaged with the creatures; the rays and otters being particular favourites. 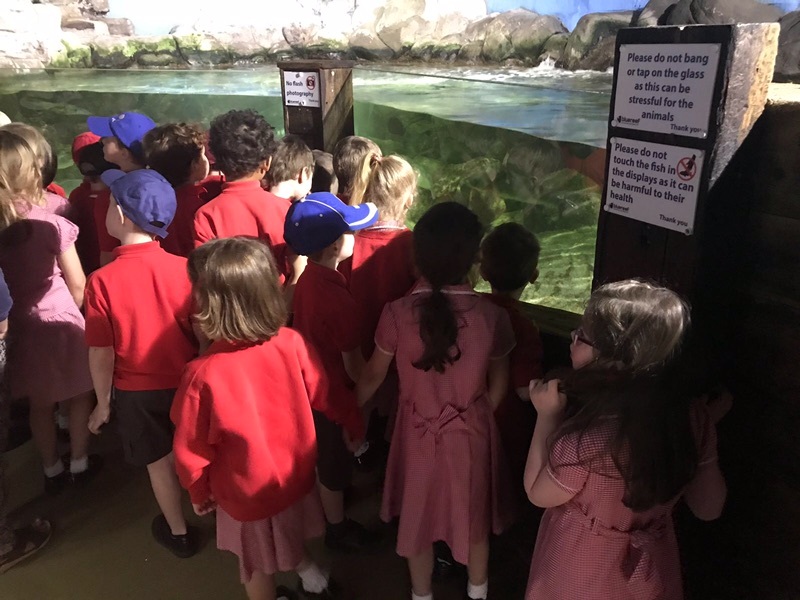 The aquarium staff were fantastic and shared their considerable knowledge, which the children lapped up. What a great day. We had a lovely Mother’s Day service at St James Church on Sunday 11th March. The school children sang 3 songs for their Mummy’s, while the older children read out thank you messages. At the end all the mums got a little bouquet of fresh flowers. We all gathered at St James Church for our end of term Church Service. 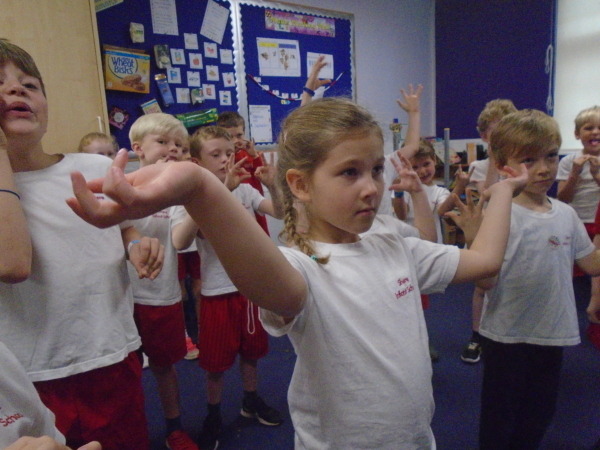 Year 1 acted out an abridged version of ‘Angel on Wings’ by Michael Morpurgo and ended up with a cheery song from the nativity performance. 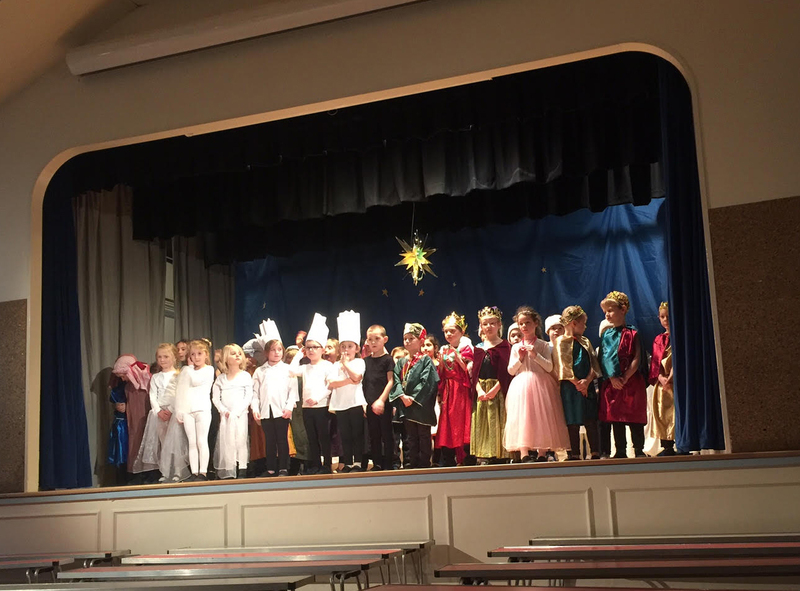 Our Early Years Foundation had their Nativity Performances on 13th & 15th December & Key Stage One were on 19th & 20th December. The children were fabulous, everyone remembered their lines and sang their hearts out. Foxes, Hedgehogs and Owl’s had a great day at Wisley. They made Christmas cards, Cone Owls and Reindeer hats in the learning centre. Then went out to explore the greenhouse and gardens. We even had time for a little run-around in the play area. The children and teachers welcomed Rory McCann to the school this week. Rory, an amazing artist spent the week with us painting a wall at the entrance to our new classroom. He managed to include classic characters from past and present. The weather was terrible for our Christmas Fair this year but it didn’t stop a great turn-out from parents and the local community. Father Christmas arrived in a horse and cart and then made himself comfortable in his grotto. 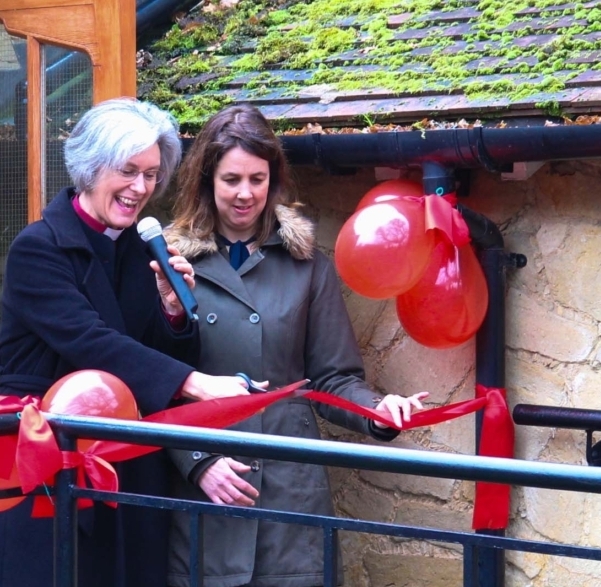 On Monday 4th December the Bishop of Dorking came to the school to open our new nursery and classroom. It was a very exciting day and the school looked fantastic. We held our yearly Reindeer Run at school today. The weather was not good for us, it was pouring with rain but all children in the school and nursery managed a couple of laps of our playground. It was all in aid of the Phyllis Tuckwell Hospice, a great local charity. 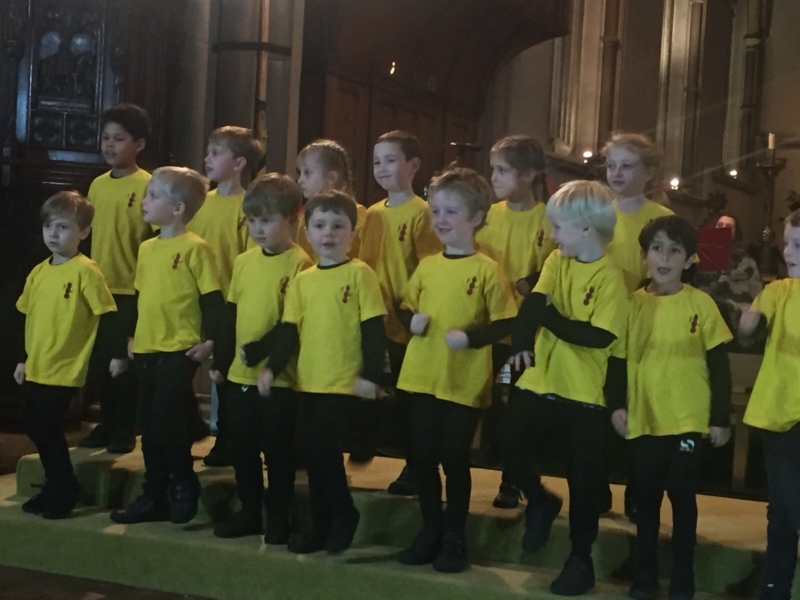 All the children who attend our Production Bugs Club attended St Martins Church in Dorking for a Carol Concert. Our children did really well and sang their hearts out. Well done children! 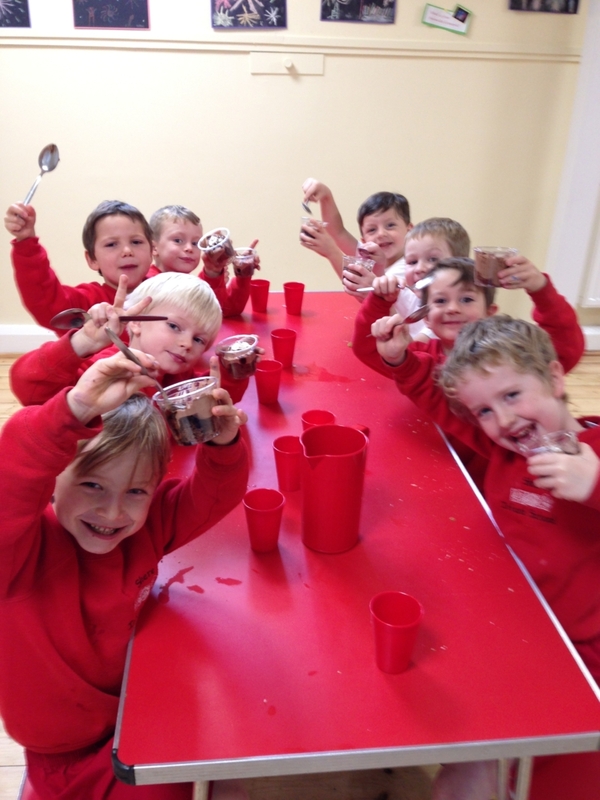 To celebrate ‘National School Meals Week’ the children had a special lunch of roast gammon with green beans and cauliflower followed by chocolate sundae dessert. The chocolate dessert went down very well indeed. 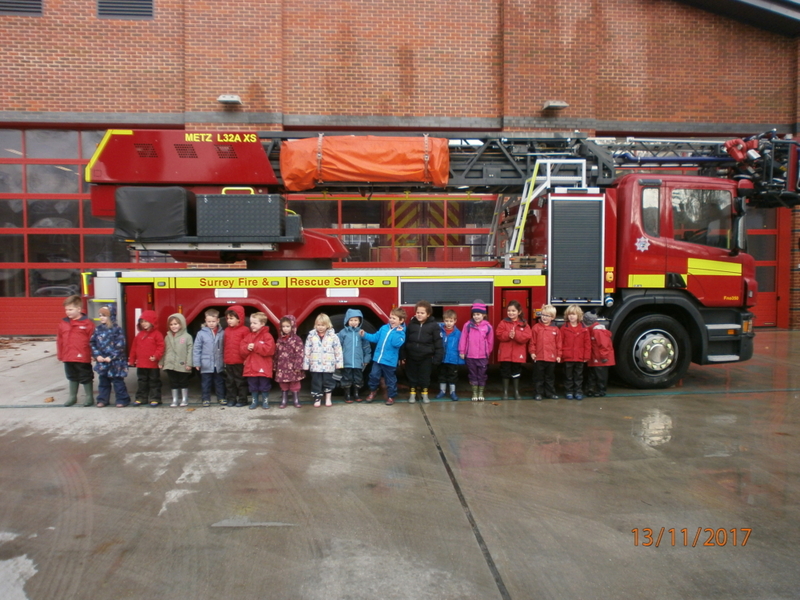 Year R had a fun morning at Guildford Fire Station. The children rode in the fire engine with sirens and horns going, they all took it in turns to go on the ladder and sprayed water from the hose. They learnt about fire alarms, ‘stop, drop and roll’ and what to do if there is a fire in the building. The firemen also made snow by firing soap out of their hoses. Thank you to all the firemen that made the trip so exciting. 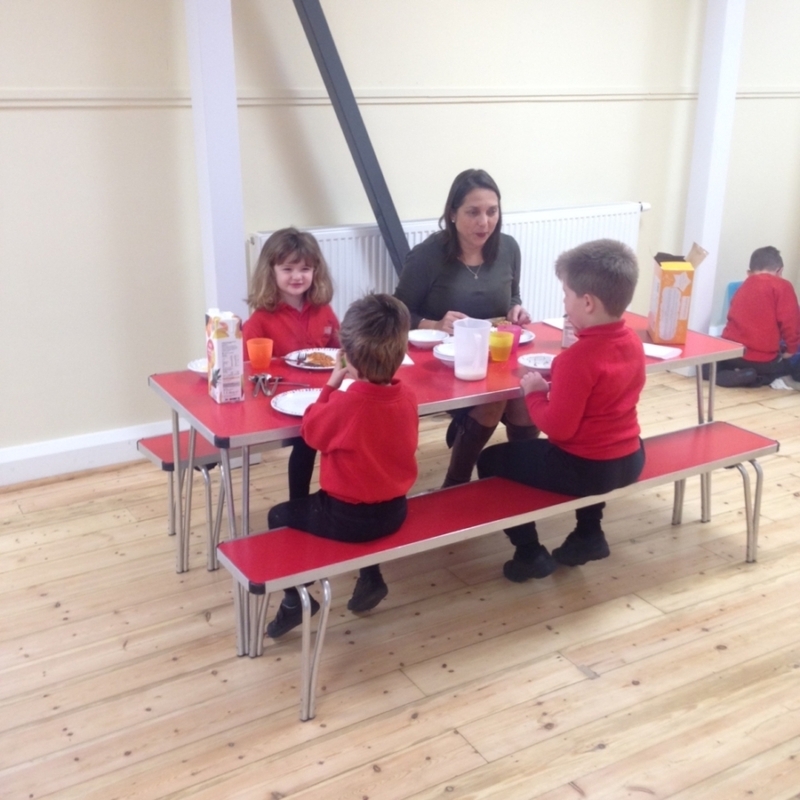 Our ever popular breakfast club has been upgraded this term! We have our School Cook on board cooking a selection of hot and cold breakfasts, with fruit and juices. The menu includes porridge, bagels, beans on toast and scrambled egg. Breakfast club starts at 8am and is £4.75 per session. We had a special Diwali celebration at the Shere Village Hall this afternoon. 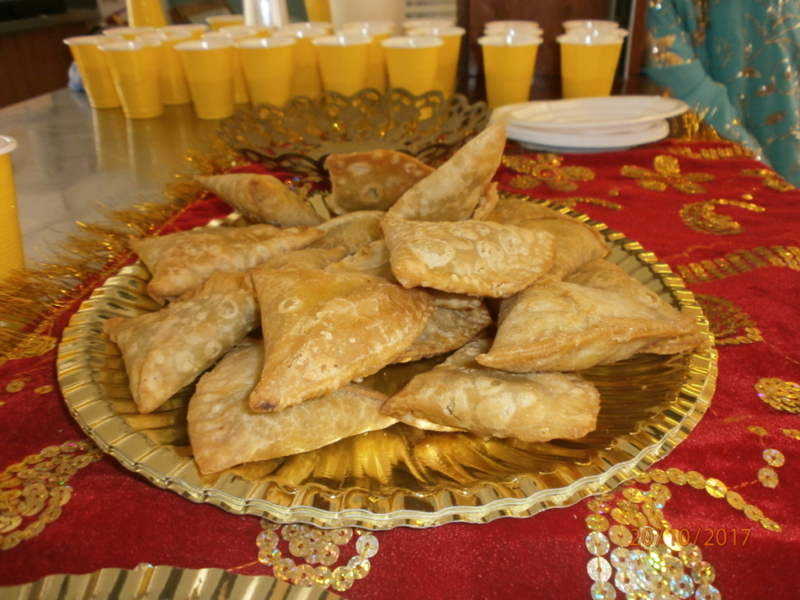 Children listened to some Diwali stories, made some samosa’s (and ate them) and also had the chance to do some Indian dancing. Thank you so much Tushna Vandrevela, Sunny Bridges and Jenna Mckay for your help. 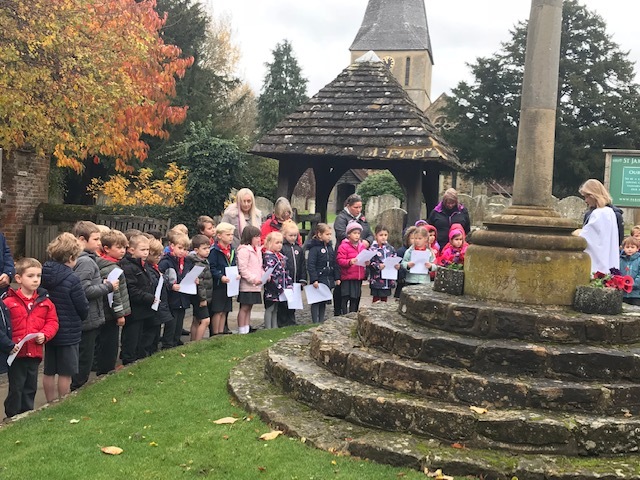 Year 1 took a walk to St James Church in Shere on Thursday. Their task was to sketch the church – they look like they are working very hard!! The day started off at Littlehampton Museum looking at the history of Littlehampton, followed by an afternoon on the beach. It was very windy but lots of fun. 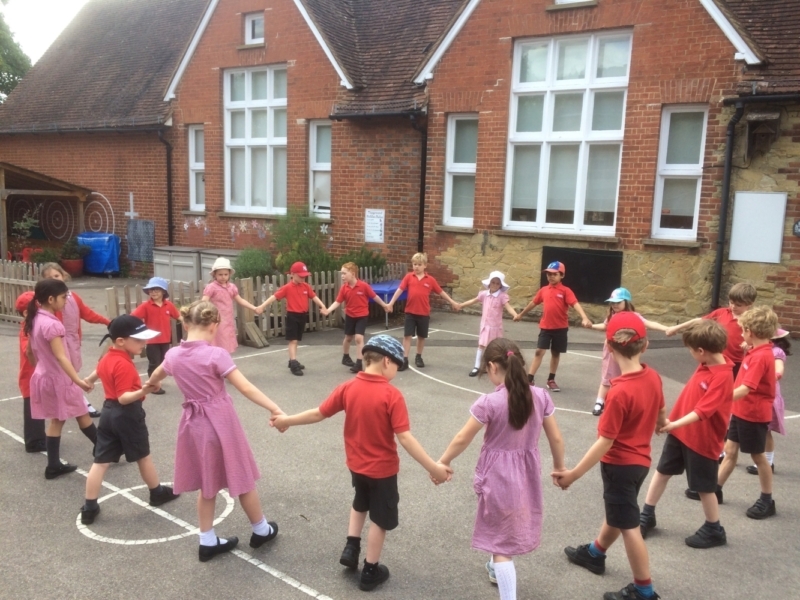 Country Dancing practise for the Shere Street Party. 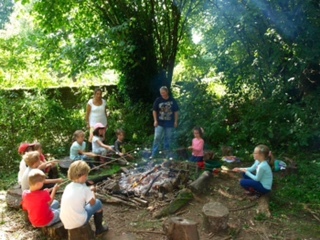 Toasted marshmallows at Forest School this morning! 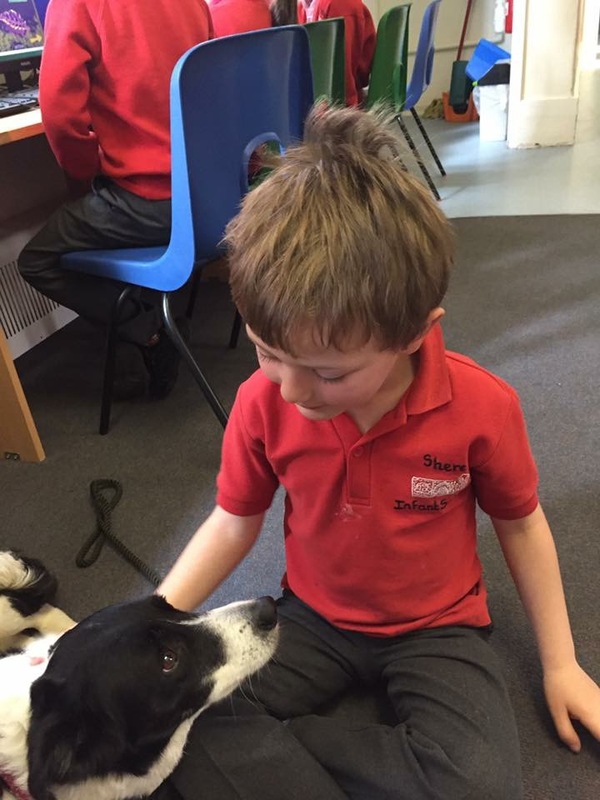 Enjoying some quality time with Lily, our Reading Dog. Our Robin Class cool down in the stream on a hot day! 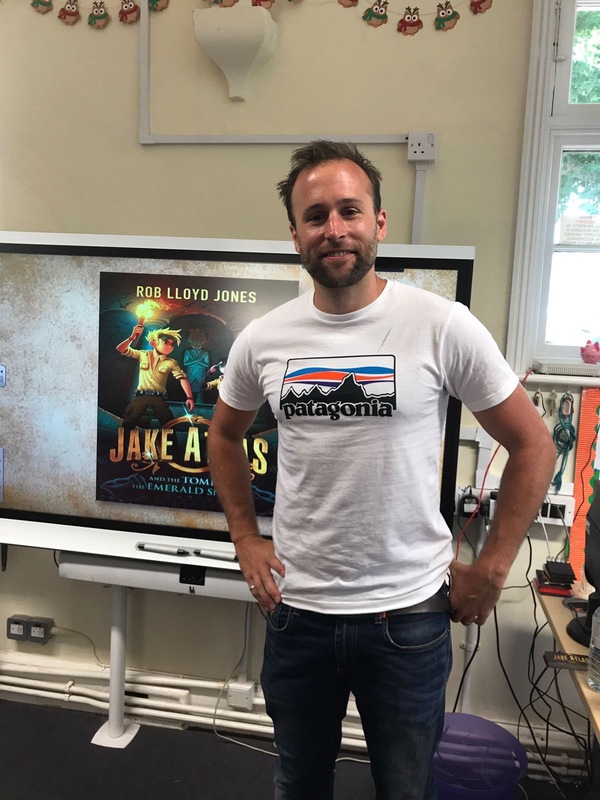 We had a visit today from Rob Lloyd Jones, author of Jake Atlas and The Tomb of the Emerald Snake. 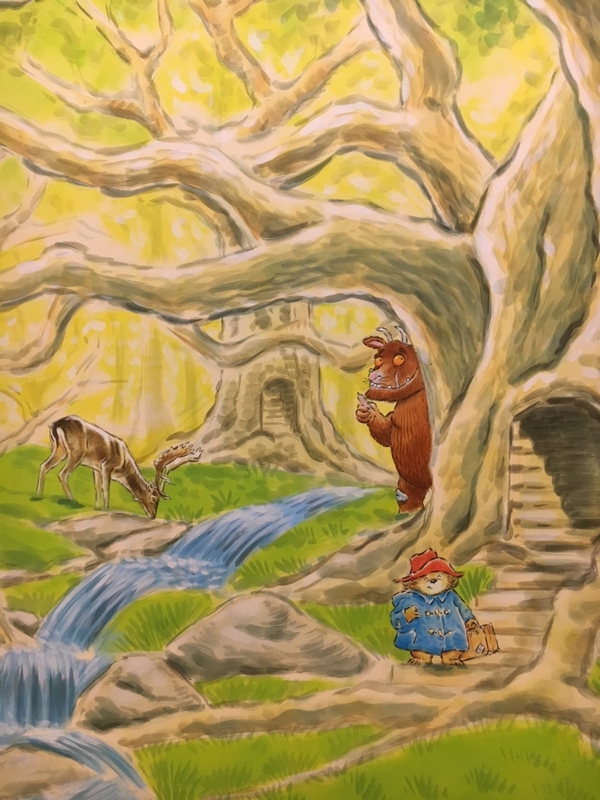 The children listened to him talking about his travels and adventures. It coincided with our current topic Ancient Egypt. 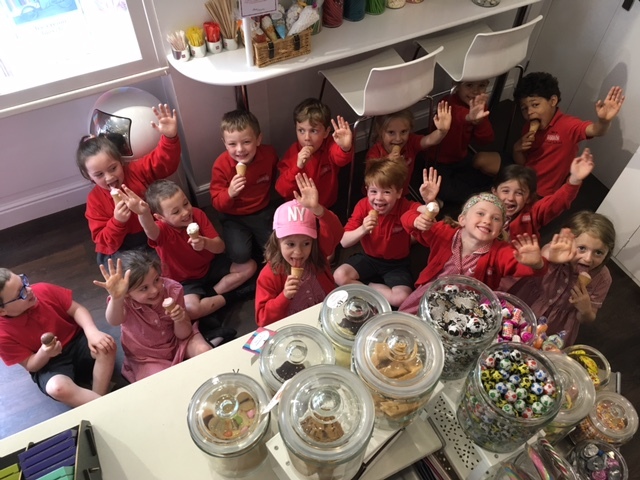 Wren Class had an impromptu trip to the local ice cream shop this morning!! They all look extremely happy. 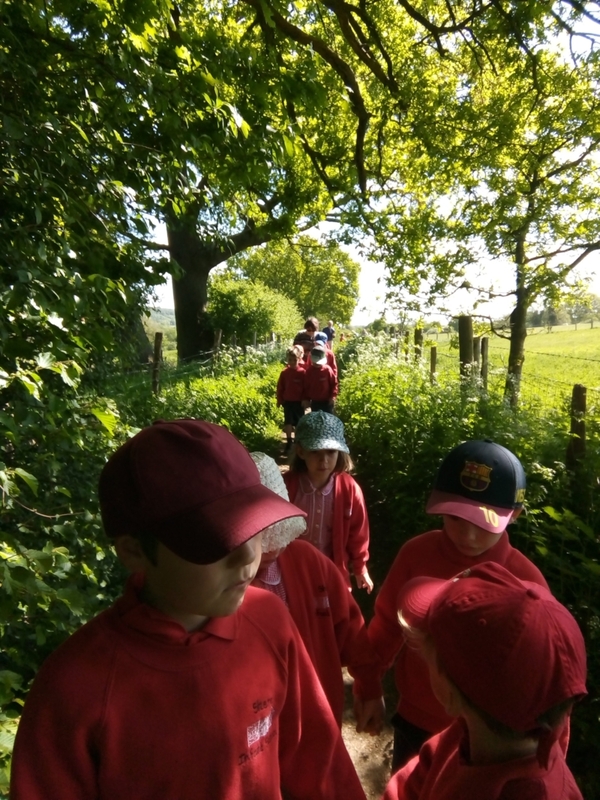 We all walked to the top of a hill behind Shere School to celebrate Ascension Day today, it was a beautiful day for it! The children of Shere School got together before lunch to say goodbye to our lunchtime supervisor of 15 years! They said prayers, sang songs and told of their memories of Mrs Minns. The whole school travelled back in time today. The children used historical enquiry to work out what time they landed in! They found huge dinosaur eggs in the school hall and footprints in the playground. The whole school were very excited to go to the Winchester Science Centre on Tuesday. 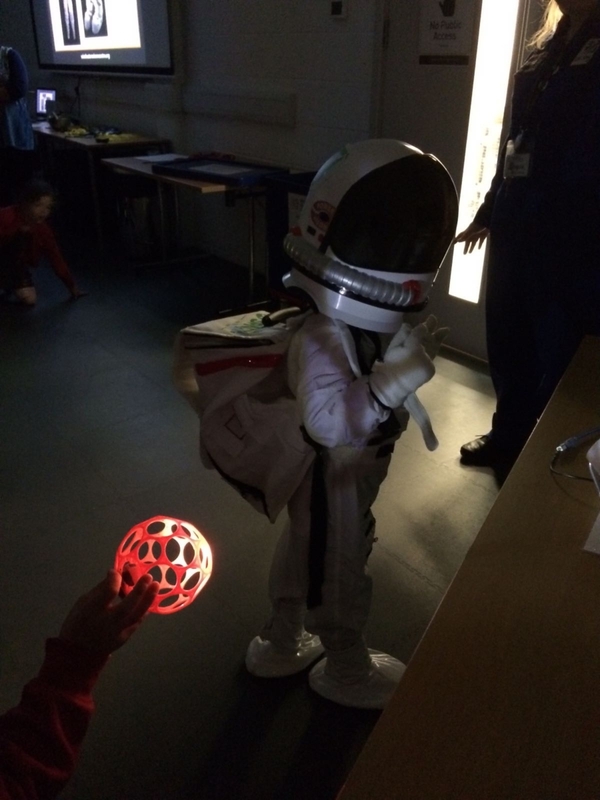 Year R spent time in the Planetarium watching a film about 2 children going into space on a cardboard rocket. 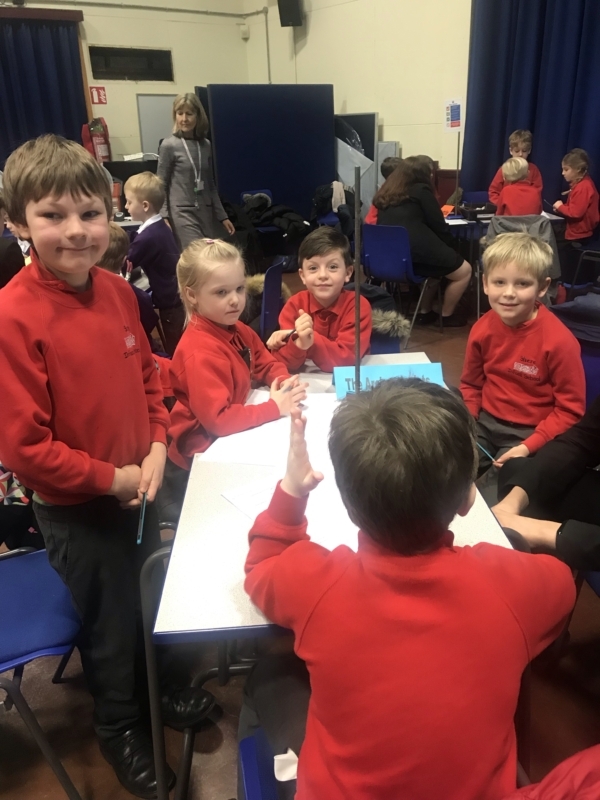 Year 1 & 2 attended a Destination Space workshop where they had to send a member of the class to the International Space Station to repair a broken battery. When the children weren’t in a workshop they could explore over 100 interactive exhibits in the Science Centre. 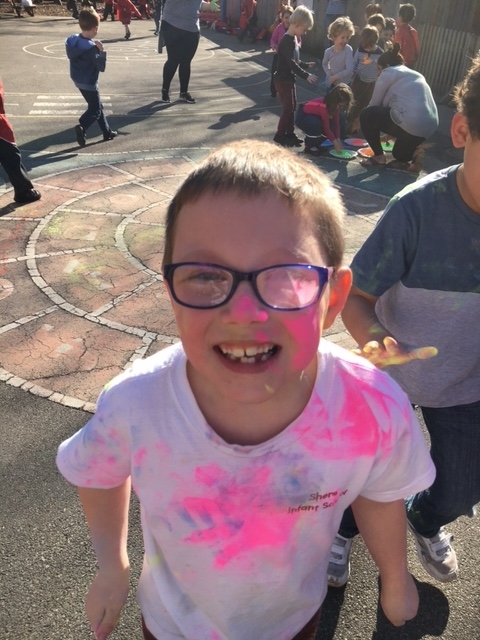 Just before home time the children changed into old clothes and went out in the playground to have a huge paint fight. Staff and parents joined in too, I am not sure who enjoyed it the most!!! Each of our classes get to spend a morning at the Spectrum Leisure Centre in Guildford at an Athletics Workshop run by George Abbot School. 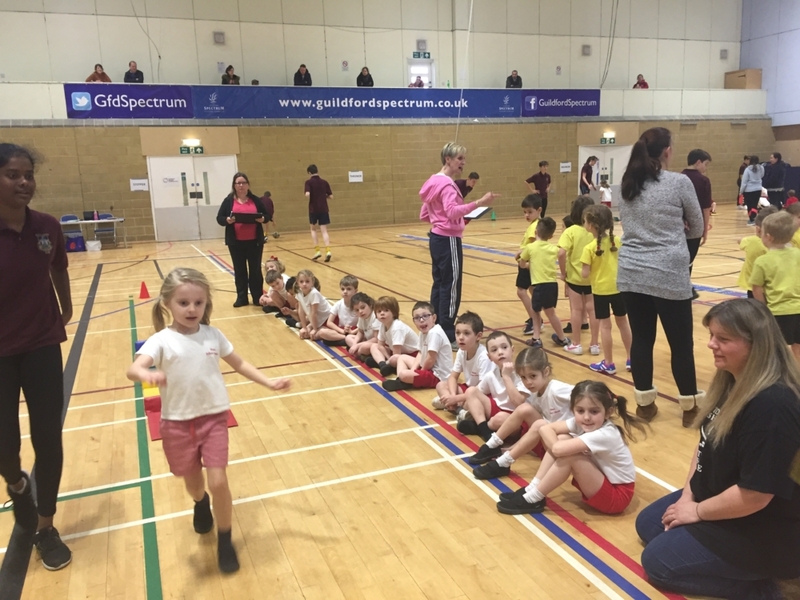 Our children got to compete against other schools in the area, taking part in running, jumping, throwing and rolling activities. All of our children were cheering each other on, it was great to see such teamwork. Lots of children from different schools were invited to the annual Science Challenge at Glebelands Secondary School. Owls had five teams called Shere Genius 1, 2, 3, 4, and 5. 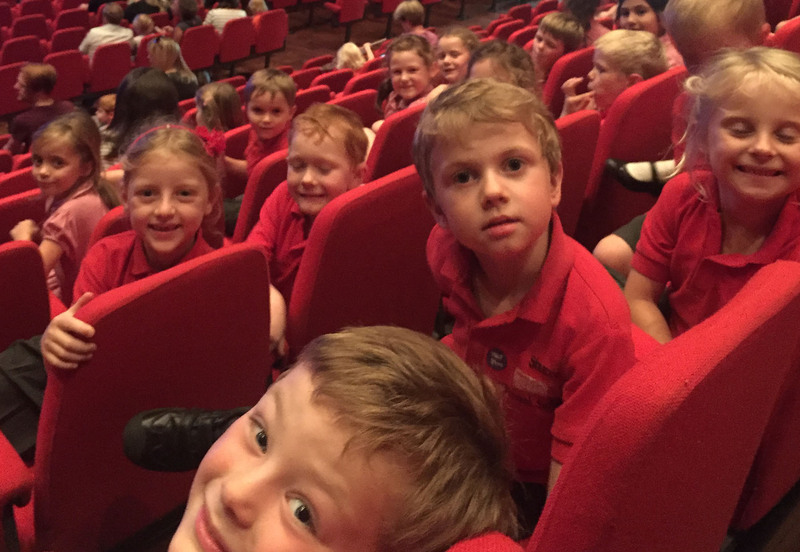 To coincide with our ‘I Opened a Book’ Topic, Years 1 and 2 went to see “Stick Man” at GLive. The children loved the show, enthusiastically joining in with the panto-style parts of the story. All were well-behaved throughout the afternoon and were a credit to our school. 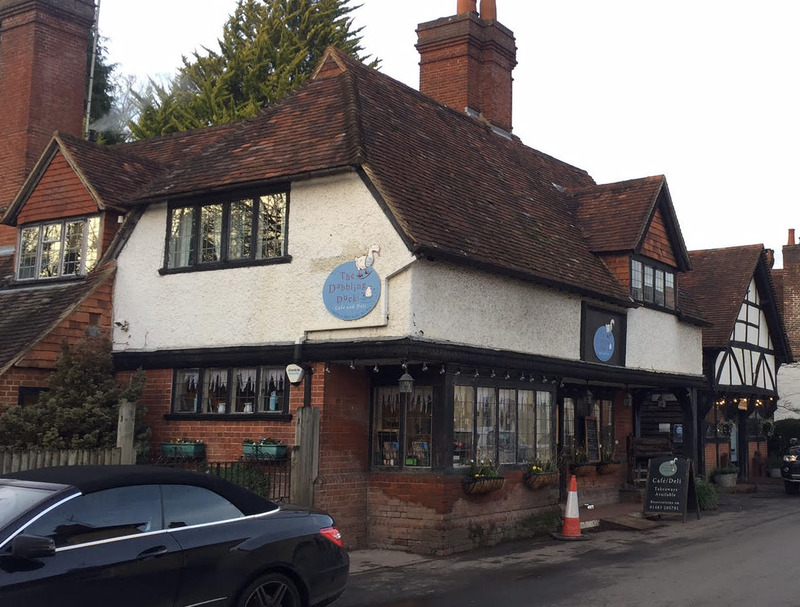 The Dubbling Duck Café in Shere very kindly offered to do some baking with our older children. Years 1 and 2 were divided into groups of ten. 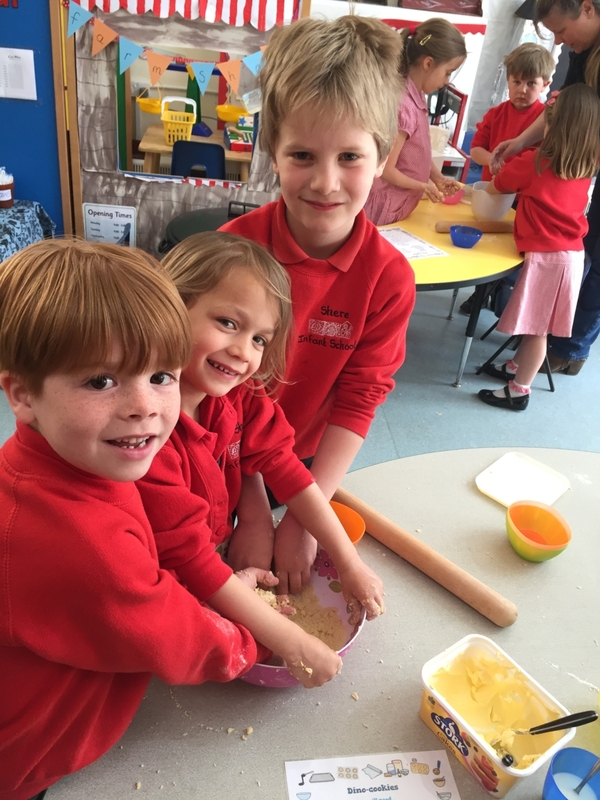 Each, in turn, walked to the café with Mrs Voller and had a fantastic time making flapjacks. At the end of the day these were delivered back to the school and the children took them home to eat. They were scrummy!! We were so proud of our super football team today. 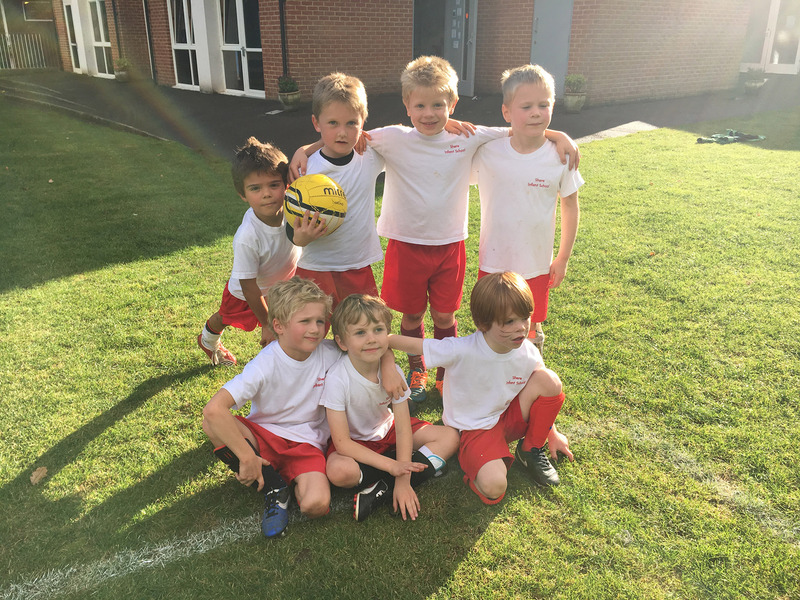 They came second in the Longacre Football Tournament and played so well. They were little superstars and all were presented with a shiny medal. We had our first open morning for perspective parents to bring their children to see the school, meet the teachers and have a play. It was a success with a great turnout. 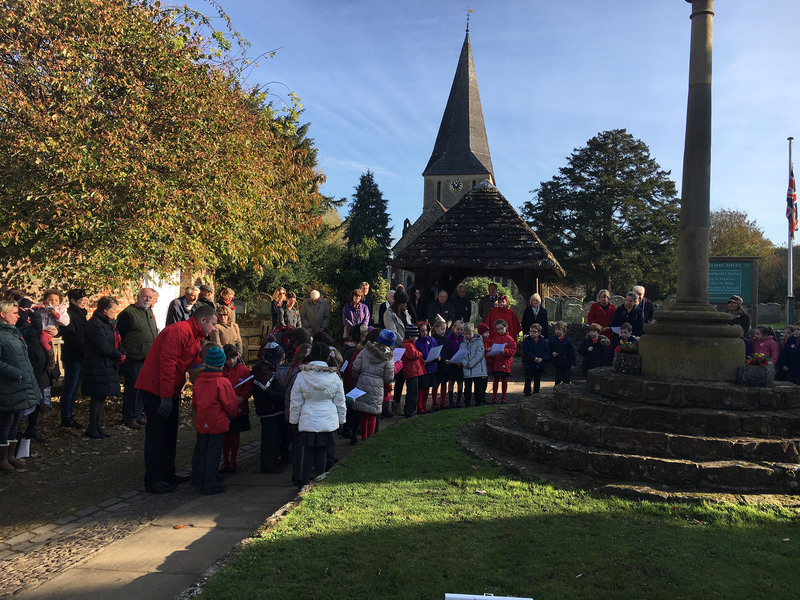 Our Year 1 and Year 2 children gathered by the war memorial in Shere to share in the annual Remembrance Service. 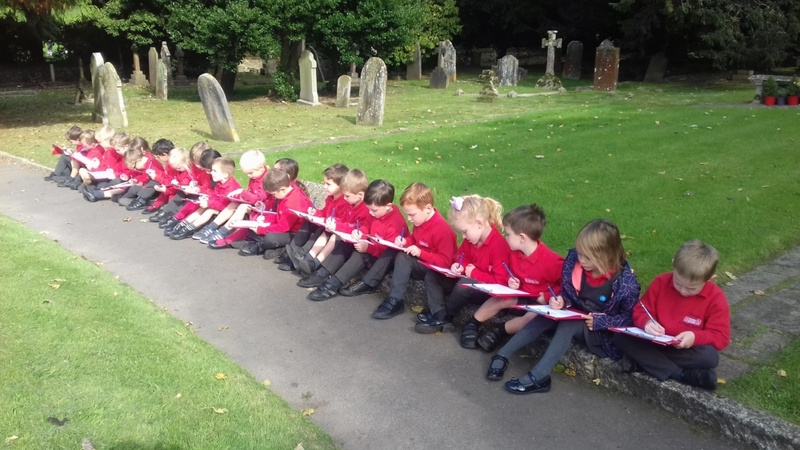 Some of our Year 2 children read prayers they had written in class for the soldiers who lost their lives fighting for our country. After prayers they all sang “We Will Remember” (a bit of a tear jerker). It was our Christmas Fair on Saturday and the proceedings began with our traditional meeting at the square in Shere. 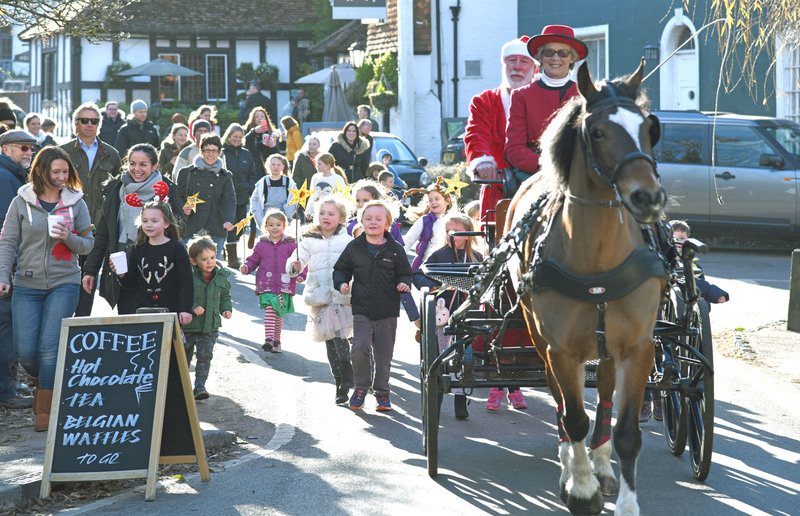 Santa arrived on a horse and cart and all the children followed him down Middle Street to the Village Hall where the fair was officially opened. 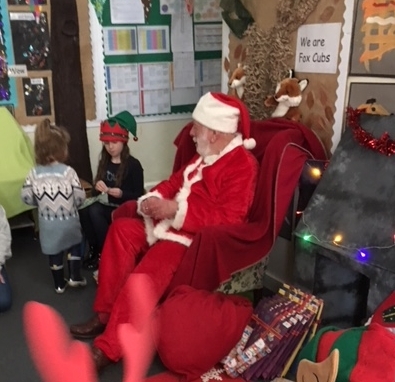 We had super stalls, raffles, tombolas, goodie bag stalls and the children also had the opportunity to meet Santa in his grotto. The food stall sold some delicious turkey and cranberry rolls, mince pies and mulled wine ensuring that nobody was left hungry. Photo – John Powell. 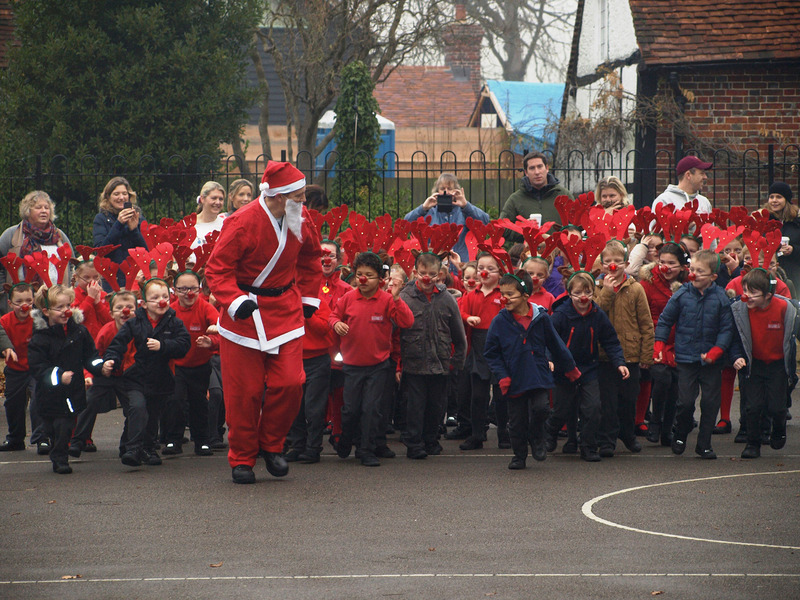 All of our children enjoyed the reindeer run on Tuesday morning. 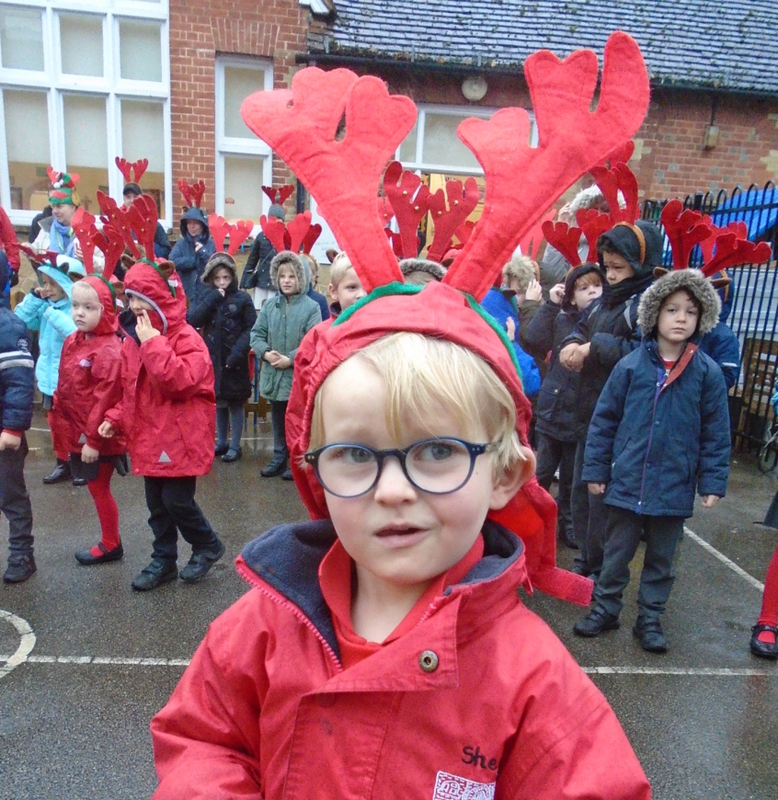 They dressed up in reindeer antlers and flashing red noses before chasing Father Christmas around the playground! (They managed ten laps this year compared to last year’s three and all did really well, with hearty encouragement from an enthusiastic group of our parents. 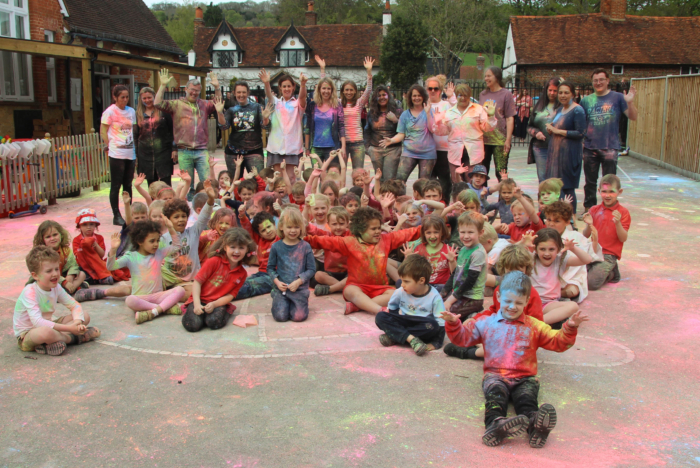 It was all for a good cause and the school raised over £500 for the Phyllis Tuckwell Hospice in Farnham. 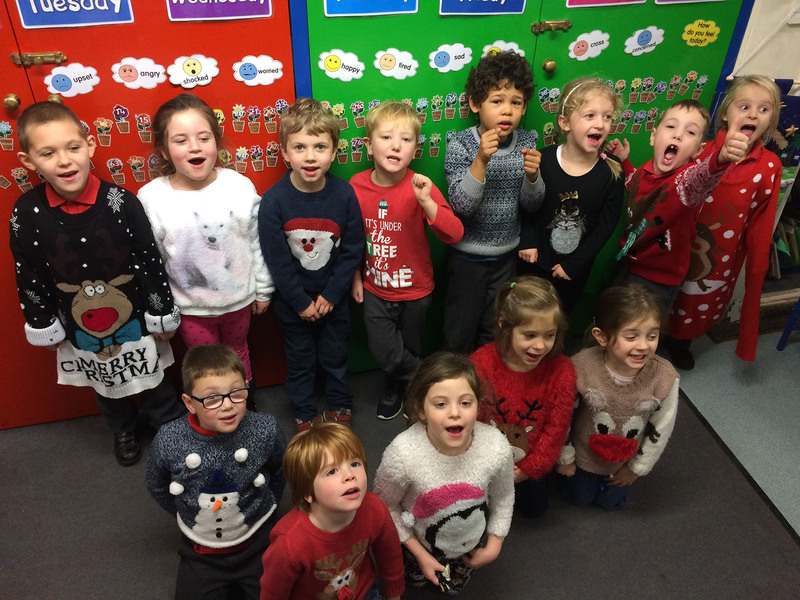 The children really enjoyed coming to school in their fancy Christmas jumpers today. Don’t they look festive? This was our first year of including the whole school in the one nativity play. ‘The Bossy King’ was played brilliantly by Edward in Year 2 and he was a very bossy king indeed. All our reception class children were angels and they all sang their hearts out. It was very enjoyable. Thank you to Ms Bailey for all her hard work in putting together our production and to Jude Pitcher (mum of Isla in Year 2) for sorting all the brilliant costumes and props. 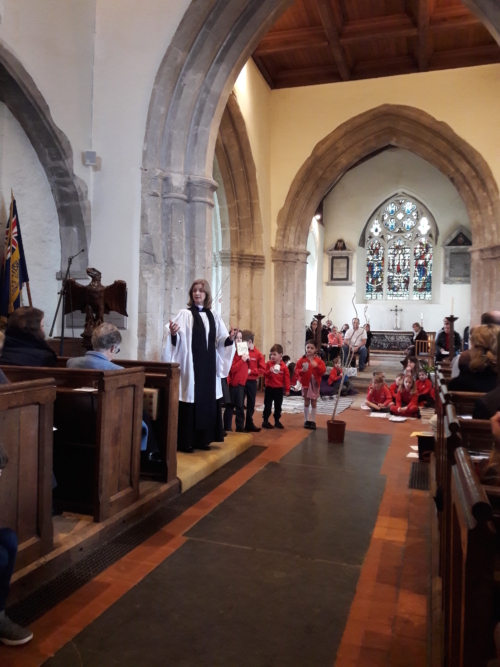 The whole school attended church for an end of term Church Service. 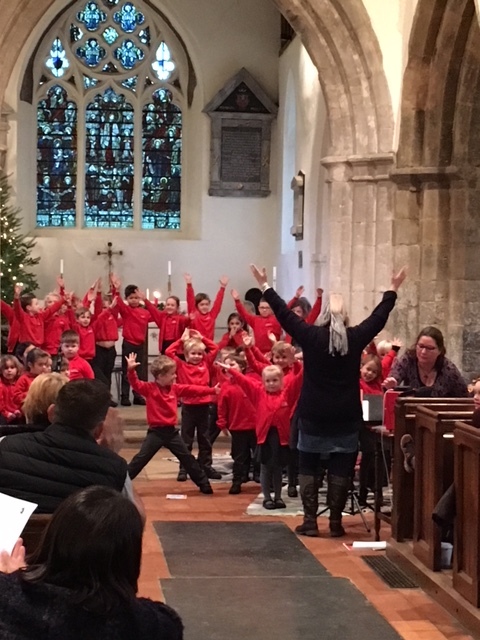 Year 1 gave their own rendition of the Nativity Story and the whole school sang some of our favourite festive songs to mark the end of a busy school term.